For years I sneered at NPR’s hugely popular “This American Life” radio show, and shrugged when people would implore me to listen: “ohmygod howcouldyounotLOVE that show????!?”. I don’t know. I think it was host Ira Glass himself. His cadence, his tone. Glass is effeminate, precious and snarky, even when he’s only muttering a few syllables, and for years he epitomized for me one of those NPR demigods that people with Volvos and mini-SUVs and mortgages and 2.5 kids looked up to. Oh – and for the record – I have a mortgage and a Suburu Foerster, in which we tote our 1.0 children to school every day, and I do enjoy some of the NPR programming from time to time. But I still didn’t like the show. Maybe it’s because I wasn’t truly listening, and because I cast a grossly unfair critical judgment based upon the flimsiest of evidence. Hey, it’s what we do over here at the Hedonist Jive! So some friends of ours had extra tickets to a “This American Life” live performance/lecture thing in Berkeley a few months ago, and asked us to come along. My wife likes the show, and while I considered staying home and alphabetizing my CDs instead, I came along – and totally dug it. It all clicked for me – the passion these interviewers put into spinning a gripping story; the evenhandedness that Glass and his cohorts employ in telling tales that they could otherwise cast summary judgment upon; and just how fun an hour-long show of true tales from ordinary people can actually be. I decided to get on board, about 10 years after everyone else did, and now I’m – well maybe not a fanatic, but I’m most definitely a fan. “THIS AMERICAN LIFE” typically unleashes a new podcast of their show each week, and rather than listen to it on the radio during its allotted timeslot (who does that anymore, right? ), I’ve been listening to them this way. Some of these episodes lately have been whoppers. They’re so good at taking the most simple of precepts and blowing them out into these dramatic, seat-gripping sagas. Recent favorites of mine include this one episode called “My Pen Pal”, about a dorky pre-teen girl in Michigan in the early 80s who inexplicably developed a deep pen-pal relationship with General Manuel Noriega of Panama, right before the US went to “war” with the country in the 80s and Noriega was jailed on drug trafficking charges. 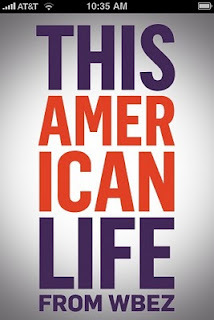 I swear, “This American Life” told this story so beautifully through interviews, voiceover and snippets of TV coverage from back in the day that I had to just sit in the parking lot at work for 20 minutes after I got in just so I could finish it. Another superb episode was an hour-long recollection by a guy who found an old abandoned house with his friends when he was a kid, and the weirdness they discovered inside. It led to a years-long fascination with piecing together the strange story of the people who lived there, and to a ton of regret once he did. I was riveted, and you could tell from Glass’s introduction that he knew they had a remarkable story to tell, and gave up the entire hour to tell it. This is the sort of charge people got out of old-time radio, in the days when the whole family would gather around the living room radio for ghost stories or “Amos & Andy”, now updated for the podcast generation. Now that I’ve consumed a couple dozen episodes of this show, some dating back to their early days a decade ago, I obviously can see what I was missing. It’s rare for them to misfire, too – a story will start out on the most mundane of topics and you think, “Aw, I’ll just skip this one” – and then wham, you’re in. The only stuff they do that I just can’t stand is from their friends at another audio-production house called RADIO LAB. Full of cut-ups, sound effects and general “look at us, we’re wacky” sort of tomfoolery, the Radio Lab stuff is easily the worst part of any This American Life show, and thankfully they’re only on a handful of recent episodes. I’m hoping I’ve heard the last of them. And Ira? Well, Ira’s now one of my favorite things about the show. You just gotta get to know him the way I finally did. Not only does his sensibility, such that it is, inform the entire show, he’s probably their best interviewer - and when he leads a particular story, it’s a pretty good bet that it’s going to be the finest piece in any given hour. I’ve not seen the TV show these guys put together on Showtime a few years back, but it’s now “on the list”. Meanwhile, if you’ve been resisting “This American Life” for the reasons I was, I’m humbly recommending that you fight your prejudice and give it a go.